Give yourself advance warning of any possible storms crossing your route. Plan possible stops at truck stops or other safe locations in case you do not feel safe driving through the weather. If you deem the road conditions are unfit to drive, contact your Driver Manager or Business Manager and inform them of the situation. Can a semi-truck and trailer hydroplane? Yes. A commercial truck is heavier than a passenger car but it still follows the rules of physics. Under normal highway conditions, TransAm Trucking recommends maintaining at least a 7-second following distance. However, during inclement weather tractions decrease. If you are driving while it is raining, we recommend increasing your following distance even further. You may be driving at a slower pace, but you increase your chances of arriving at your destination safely. Make sure your lights and windshield wipers are working. During your pre- and post-trip inspections don’t forget to check your lights and windshield wipers. Visibility decreases during inclement weather. Increase your safety by turning on your lights. You want to see and be seen. Avoid parking on grassy or hard dirt surfaces. 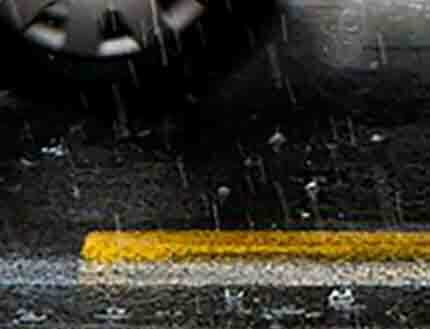 If it is raining or recently rained, avoid parking on grass and compact dirt, especially along a road’s shoulder. Be aware of puddles or standing water as they can compromise the integrity of the ground beneath them. Parking on saturated ground can cause the tires to slide down embankments or sink into the mud, causing unnecessary delays or damage to your truck and/or trailer. Try to avoid driving or turning around on dirt lots. Compact dirt roads and parking lots usually turn into mud swamps after and/or during a rainstorm. Spinning tires on heavy trucks kick up mud, sinking the tires in the ground like the truck is standing on quicksand. The best way to avoid getting stuck is avoid these areas, if possible. Do not drive through flooded roads. Commercial trucks may sit higher than passenger cars but they are no match for moving water. Floods can erode roadways creating potholes and damage you cannot see. If the water is high enough, it can flood your engine or sweep you and your truck down the road. Remember, it is possible for trucks to become stuck and stranded in floodwaters. Avoid unnecessary repairs and damage to yourself and your equipment by playing it safe during inclement weather. Safety is important. If you come across a flooded or damaged road, or if you do not think it is safe to drive, contact your Driver Manager or Business Manager. Our greatest asset at TransAm Trucking is you so make it a safe day!